Gordon N. Dregich, age 89, of Alliance, passed away at 6:05 a.m. Monday, February 26, 2018, at Community Care Center. He was born June 6, 1928, in Alliance, Ohio, to Nicholas and Mary Dregich and had been a lifelong Alliance resident. 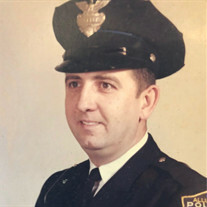 Gordon proudly served his country in the United States Army and was employed as an Alliance Police Officer for twenty seven years. Survivors include his daughters, Joann (David) Ream Sr., Dawn (John) Stauffenger, and Kim (Ray) Muniz; son, Gordon Dregich, II; eleven grandchildren; and thirteen great-grandchildren. Gordon was preceded in death by his parents; wife, Miriam (Whitaker) Dregich whom he married August 19, 1950: and his precious daughter, Jill Kennedy.